Situated on the Somerset coast this town once had an importance as the northern terminus of The Somerset & Dorset Railway (S&D) which linked the Bristol channel with the English channel. The pier at Burnham received rails from Welsh steelworks to be carried onwards to the expanding rail network in southern England. The S&D Railway had many bolster wagon pairs for this traffic. Pleasure ships, like the paddle steamer "Waverley" would also call in regularly during the summer, especially on cross channel trips. 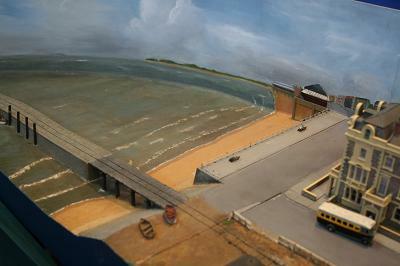 The pier was used by the lifeboat, which had it's own private siding. The railway station, opened on the 3rd May 1858, unusually featured a short overall roof and a long platform for excursion trains. The station closed to normal passenger workings on the 29th October 1951, excursion traffic continuing to 8th September 1962 and closed to goods on the 20th May 1963. The model was made originally to 2mm finescale standards and exhibited by the late Denys Brownlee. After his death the model was sold and then stored for some years. I recently bought the model, by now a little worse for wear and have set about rejuvenating it to exhibit. Most work has been under the baseboards so far. Now to tidy up above and make some correct rolling stock (a big job!). 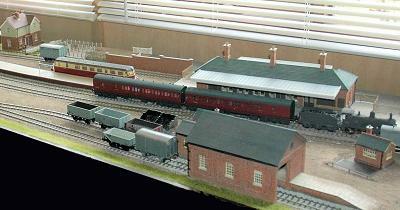 It is intended to depict the S&DJR scene in the 1920's - 1930's and rolling stock is being made to show this. Current stock is mainly borrowed or adapted "N" gauge. 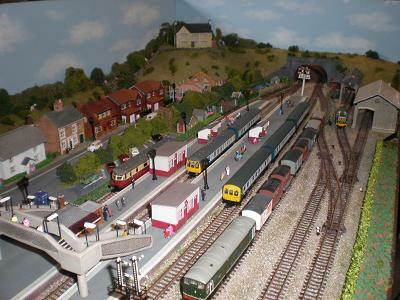 Burntwood Lane is an EM Gauge layout that is set in the late 1950’s and early 60’s, when the line formed part of British Rail’s Southern Region. Burntwood Lane is a branch line between Caterham and the main line at Purley. 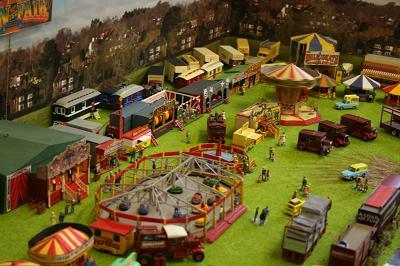 The layout is named from the road Burntwood Lane which crosses the line south of Whyteleafe South and north of Caterham. The track and points are hand built using C&L Finescale components. 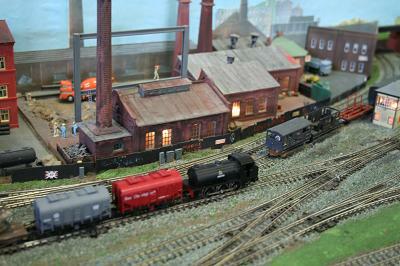 The buildings and bridges are scratch built, based on a set of photographs taken in 2011. The Lake District is rich in minerals and the area around Buttermere had iron and copper mines. 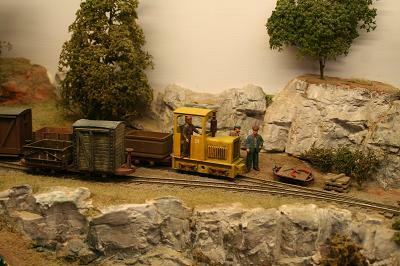 The Buttermere Mining Company extracts copper bearing ores from three underground mines. The mining company built an 18 inch gauge line in 1895 to carry the ore from the mines to Cockermouth, 10 miles away. The line was originally worked by steam locomotives but internal combustion locomotives were introduced in the 1930s. After World War II the diesel power completely replaced steam. Enthusiasts have restored a couple of steam locomotives and these can occasionally be seen giving rides to tourists. The layout has been designed to fit into a Ford Fiesta and still leave enough room for a driver and passenger. The scale is 7mm/foot and the gauge is 9mm. Baseboards are made from 9mm plywood. Control of locomotives and points is by a Digitrax DCC system with wireless throttles. Track is Peco with Tortoise Slow Motion Switch Machines. 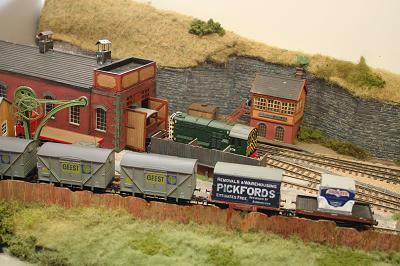 Rolling stock is a mixture of 'bashed' kits and scratch built items. 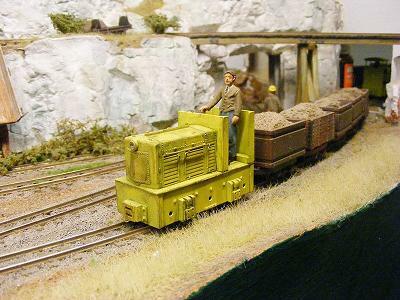 Buttermere Mining Company is designed to be viewed on both long sides and one end - also operators use wireless DCC throttles - to allow this to happen comfortably we need to have clear access to three sides of the layout. Two villages named Cherington actually exist in the Cotswold area, near Tetbury and to the north west of Hook Norton neither had railways. Branches could have been built from the Kemble to Tetbury line or the Banbury and Cheltenham line. 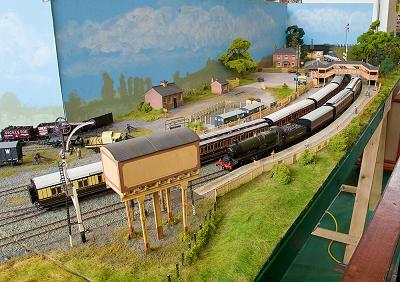 This layout is fictitious but assumes a terminus has been constructed by the Great Western Railway, it is set in the British Railways era of mid 1950's to early 1960's. Traction is provided mainly by steam locomotives of the Western Region with perhaps the occasional interloper from elsewhere. In addition some early diesels and Diesel Multiple Units may be seen. The layout is built to 4mm scale and uses SMP finescale OO track for the scenic section and Peco OO for the traverser fiddle yard. The baseboards are built from 9mm plywood and are covered in cork to form the track base. Scenery is a mixture of textures using mainly Woodland Scenics scatter of electrostatic grass. 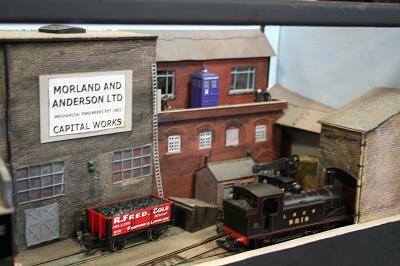 The buildings are a mixture of plastic kits used for the engine shed, signal box and yard sheds. 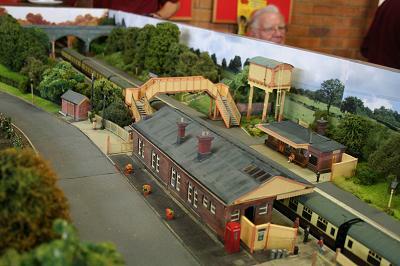 With a scratch built station building, station masters house, cremetary, goods shed and weighbridge. The cattle dock is the ratio kit modified to fit the location. The North British Railway was eager to get a connection on to the island of Mull, to rival the Oban and Callander railway. Construction started to provide a railway from Lochailort to Ardslignish on Loch Sunnart. Construction started but was soon met by protests from local land owners, the area being prime hunting country, and the lairds had friends in high places. The project was doomed from the start and the line only progressed as far as Glenuig. At Glenuig the line was prematurely terminated, but was opened to serve the remote community. With the arrival of reliable transport, the village became an important fishing community, and a ferry service was established to the small islands. The local "water of life" distillery, "Moidart", soon had its own siding and this traffic, fish and timber helped the line survive. 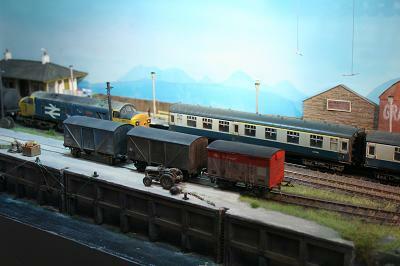 The scene is set in the early to mid 1980's, the transition between BRCW type 2s and EE type 3s. The traffic consists of 2 coach train, with the occasional mixed, two coaches and oil tanker, a small goods service, timber, grain, and fish, and an engineers train. 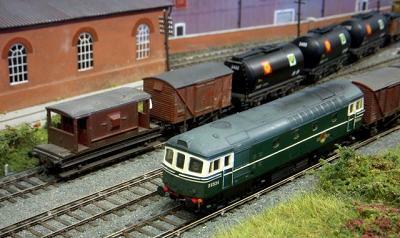 The freight stock is a mixture of unfitted and fitted short wheel base and the longer wheel base air braked wagons. 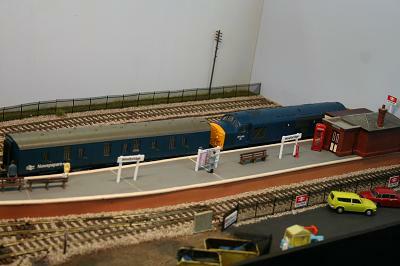 The model is 4mm, EM gauge, the space of the scenic part is 7 feet by 18 inch. occasional mixed, two coaches and oil tanker, a small goods service, timber, grain, and fish, and an engineers train. The freight stock is a mixture of unfitted and fitted short wheel base and the longer wheel base air braked wagons. The track is constructed using C&L components. All buildings and structures are scratch built. Stock is a mixture of modified RTR and kit built. 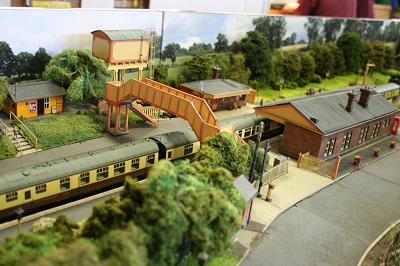 Harwood Junction was originally designed to fit in with the West Sussex N gauge group's modular layout. 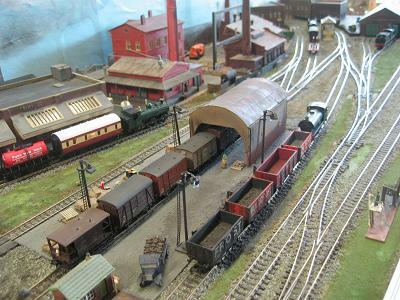 The layout in its current form depicts the changing fortunes of steam hauled freight from grouping until the Beaching axe falls. Centred on the town of Harwood, a small but industrious conurbation in the Midlands. Its main industry of brewing is situated off scene at Harwood Town .The dairy receives milk from both rail & road, after processing is dispatched the same way. Parcel, coal, livestock & general goods traffic are also catered for at the Junction. The site is now a multiplex cinema & shopping complex. Paynestown is a fictional small Western Region terminus set somewhere in the South Wales mining area. Construction is fairly standard Peco code 100 track and points. Buildings are scratch built and control is through Digitrax DCC. This layout was never intended for exhibition and was a source of amusement for enthusiasts in the back room of the little shop I used to run. It was built to OO finescale standards, the track is S.M.P. All the signals including route indicators and dummies work via H&M point motors along with the points. The period depicted is 1922, just before grouping, so I can run all sorts of liveries in through trains. You can observe the following features: 1912 Lake (crimson) coaches, red distant signals and do look out for the very tall duplicate signals. 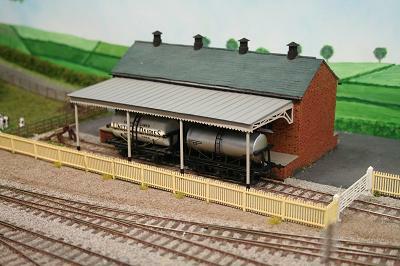 Locomotives, stock and buildings are in the main kits or scratch built. Occasionally I will run one of Felicity's locomotives namely, Brunel and Thunderbolt both with big brass domes. 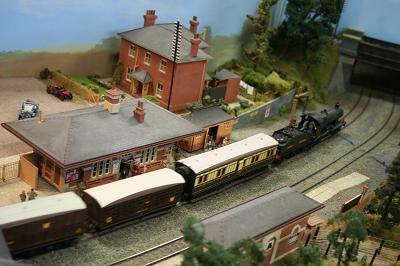 The layout is as near as possible a replica of Toddington station on the GWSR Heritage line in Gloucestershire. The era depicted is present day so there are always changes being made from one exhibition to another. For instance since Toddington’s last appearance at an exhibition several changes have been made, the ash pit adjacent to the coal yard has been dug up and re-constructed. The museum on platform 2 has been repainted a different colour and new gardeners have changed the landscape slightly. The rivet counters will no doubt notice many discrepancies but if the overall appearance looks correct then a reasonable amount of satisfaction is gained. The layout in its present form just fits into the car which makes it easy as regards transporting to exhibitions. It is of scale length so can handle the normal 6 to 7 coach train that generally run when the GWSR is fully operational. This consists of three boards 1200mm by 600mm, a rather long fiddle yard of 2400mm by 300mm plus a small hidden traverser at the Broadway end of the layout. Track and points are Peco code 75 throughout. Signals are proprietary and scratch built which are made up from Ratio odds and ends and various components collected from previous layouts. All buildings are scratch built by necessity as nothing, even remotely representative, is available on the present day market. Trees and shrubs are always changing so I make no excuse if these are not exactly correct. The time of year is May or June so that we do have some colour in the station environs. The locomotive and stock is as appears and is available to run on the railway at any given time but like the real thing visiting engines do appear. The layout is built such that it can be extended in either direction but the thought that Broadway Station will be operational in the next 2 to 3 years or so draws me to going North. Stanway Viaduct would be a nice project. 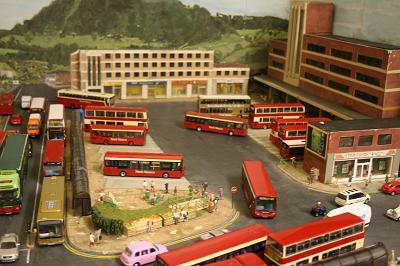 Westbridge is a fictitious exhibition layout based on the Western Region during British Rail's blue diesel era in the early 1970's. 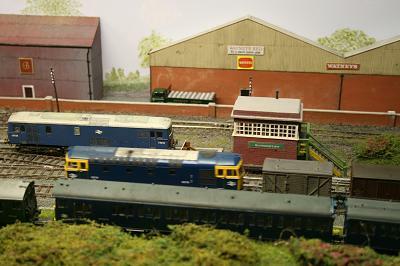 It is modelled in OO gauge and includes a small terminus station, sidings and a scratch built three road traction maintenance depot. The track is Peco Code 75, control is DCC via a NCE Powercab. Locomotives are a mixture of Bachmann and Heljan and the majority of rolling stock in Bachmann. Since it was last at the Cheltenham show, the layout has been extended by three feet, this gives me much more operational interest whilst exhibiting. Regular passenger services terminate and depart from Westbridge, these are operated either multiple unit or mk1 carriage stock. There are also occasional parcel trains, which can also be either locomotive hauled or operated by units. A station pilot is always present and occasionally shunts stock sitting at the platforms. 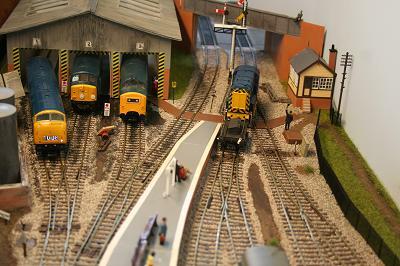 Westbridge Traction Maintenance Depot is always busy. Operations including light engine movements or oil tankers, which serves the fuelling point. 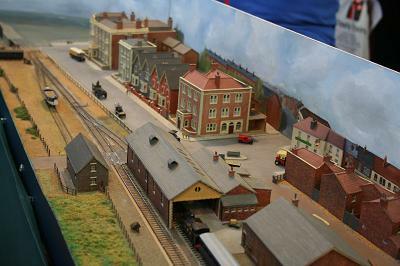 We hope you enjoy Westbridge as this is my first attempt at an exhibition layout that I built at the age of fifteen. What if they hadn't closed my local railway station in the 1960's? What might it have looked like 10 years on? The link to two cities could still be there, connecting to a proposed early park ‘n’ ride and a promised tramway system, plus local links to rapidly expanding villages and an extension to two main lines. With a mixture of public and private enterprise, a local line to an adventure park, using a restored railcar could have been developed, used too for schools and local commuters via a disused colliery line, linking at two points to main line services. What if all this had happened and had incorporated some local freight services too? Worriff, with no closures, incorporates all this, say, in 1972 with a bay platform, two through platforms and access to a small freight shunting yard. DMU's (class 101 8: 108) plus the railcar provide pas- senger services, while freight is hauled mainly by classes 24 and 33. What if? — but then again, we'll never know. Worriff — an amalgamation of several parts of the line, set in a developing small village. 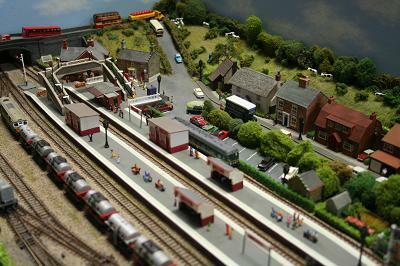 Features: electric points; 6 track (concealed) fiddle yard; village; farm and farmland; allotments; electric signals.